Posted on February 14, 2017 at 9:18 am. On February 11th 2017, 18 volunteers dedicated themselves to improving the quality of water and habitat in Kangaroo Lake. The partnership of the Kangaroo Lake Association (KLA), The Nature Conservancy (TNC), and Wisconsin’s Department of Natural Resources (WDNR), and Harbor Lumber, Inc. of Baileys Harbor made it possible to install 33 trees (renamed “Fish Sticks”) that were 40-55 feet long on the shoreline ice on the lake. When the ice melts, the trees which are cabled to the shoreline trees, will drop into the water. Mother Nature’s “magic” will then begin. Here is the coverage the local TV gave the event. These Fish Sticks will create new habitat for fish, frogs, turtles, song birds, ducks, many invertebrates, and become a new protective home for healthy lake plants including bulrushes. It is amazing that 92% of the life of the lake has its origin on the shoreline. As development and construction has occurred on lakes in Wisconsin, the shoreline has been negatively impacted. Many trees, especially those that might fall into the water, have been removed. Many fish, like perch, lay their eggs on wood in the water. All kinds of minnows find protection from predators as they begin their life in the lake. The shoreline is also protected from erosion by the trees in water. The KLA is striving to balance the “progress” of development with Mother Nature’s way of protecting the shoreline with woody habitat. Landowners are allowing the KLA volunteers to place Fish Sticks on the sides of their lake property. Volunteers including landowners are also planting bulrushes in the Fish Sticks to experiment with helping to bring back bulrushes that thrived at one time in the lake. Bulrushes are extremely healthy for the lake. KLA’s volunteers the last three winters have placed 68 large trees perpendicular to the shoreline securing them with 3/8’s inch galvanized cable. None of these harvested trees have moved after ice out. They have been harvested by Harbor Lumber, Inc. from the property owned by TNC near the lake. TNC needs to “thin out” their forest by removing non-native trees for the long term health of the native forest. According to WDNR, they must be placed in the lake before March 1st to assure that they will not interfere with any fish spawning and consequently, will enhance the life of fish in the lake. This is definitely a “win-win” solution for all. Two winters ago, KLA volunteers ventured out in -25 degree wind chill with blowing snow where they could not see more than 100 feet looking forward. Last year the opposite extreme occurred where they encountered melting ice, snow, and slush on the lake which made their work more treacherous especially hauling trees with Tom Anschutz’ truck. This year, two weeks prior to Feb. 11th, leaders were prepared to call off this “adventure” because the ice was simply not safe enough. But, colder temperatures and no snow storms improved the ice for two weeks and the workers met at 8:00 on the ice and 33 degree mostly cloudy weather installed 33 Fish Sticks. 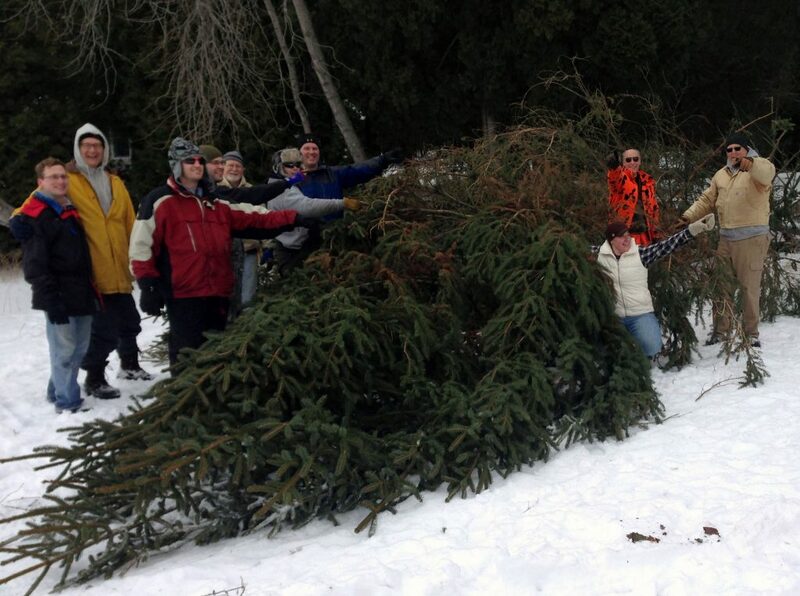 The video by Fox 11 TV Green Bay demonstrated the effort it took by 18 volunteers to move this large trees. 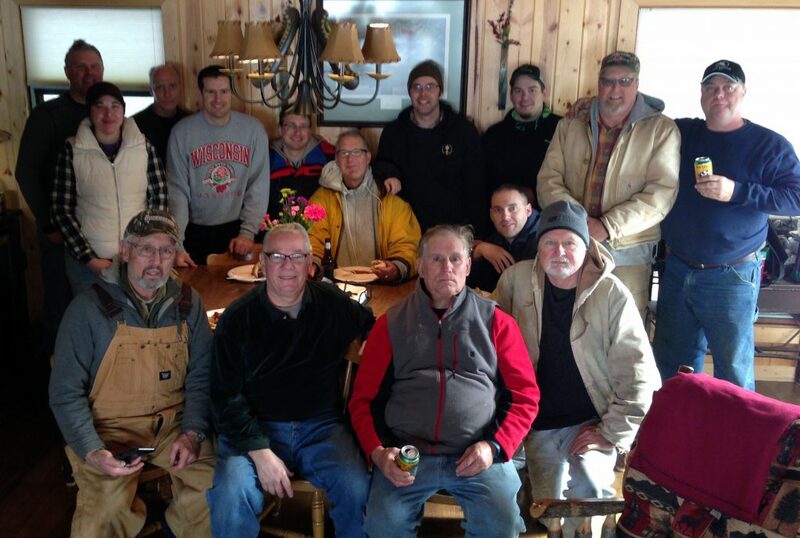 After the team cut, hauled, dragged, lifted, grunted, caught their breaths, shared a great deal of humor, and cabled the large trees to the shore, they celebrated with a luncheon worthy of their efforts as good stewards of Kangaroo Lake and the environment around the lake in Door County. KLA will be looking for additional sites to place Fish Stick complexes for next winter. Yes, it felt like a new winter sport on the lake!